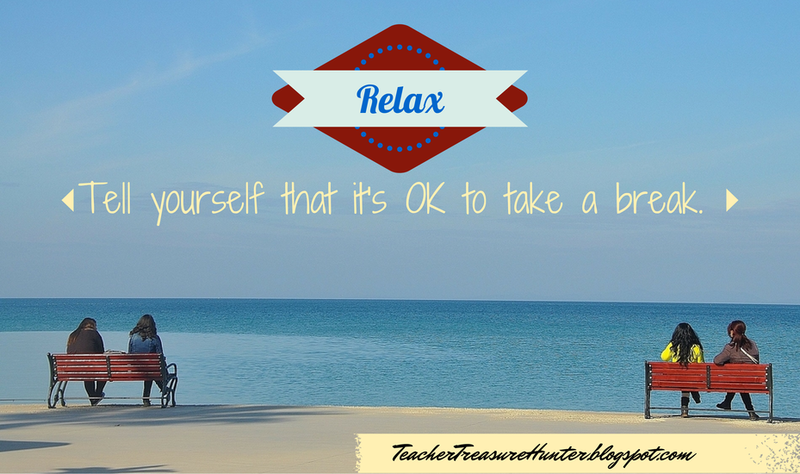 In today’s post, I’ll be sharing ways for the teacher to relax and things to help relax or calm your students. I’m sure there are MANY more that I could add to this list! I think the important thing to remember is to take time for you! The beginning of a new school year is a great time to commit to “time-out” for the teacher and schedule it. You may have students in your classroom who need “calm-down” breaks to control anger, re-focus or relieve stress and anxiety. Some of these are very apparent needs and some are more subtle. Keep in mind that all students could benefit from these strategies at some point in time. 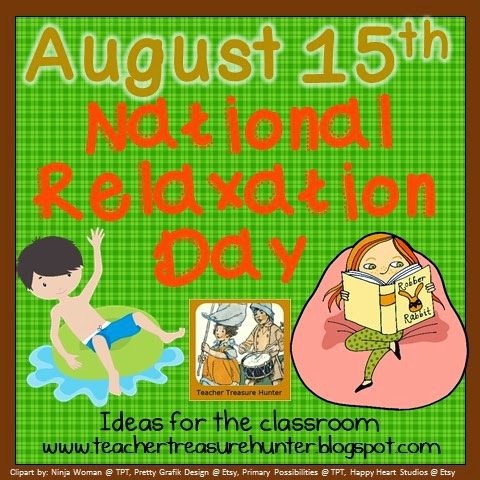 Students will usually not recognize when they need to “relax” and won’t have the tools to do so independently. 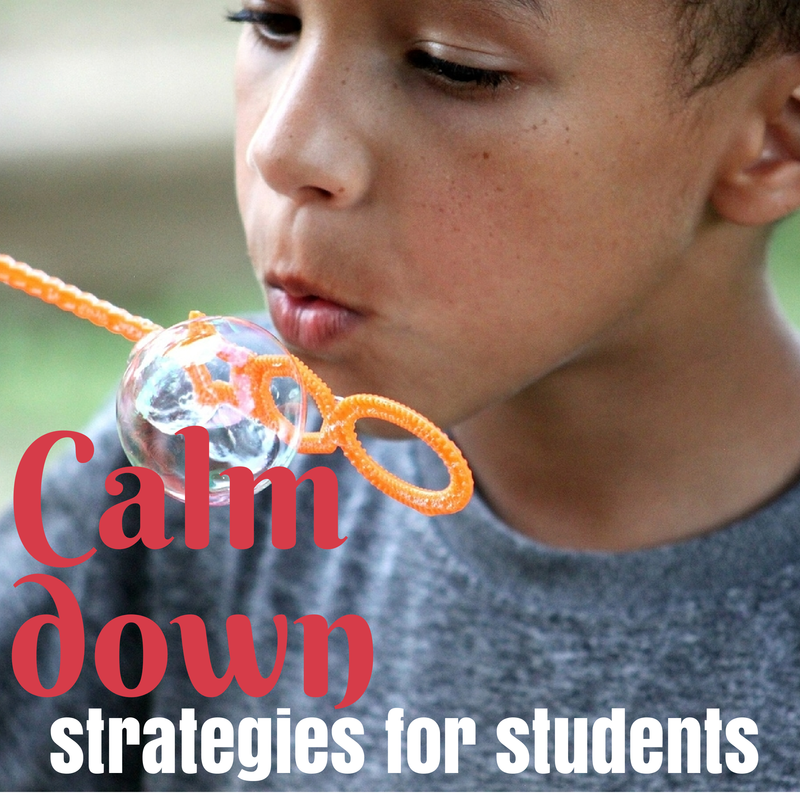 I love this list of ideas that I found for calming strategies. When I come across a need like this, I’m often looking through my professional books or searching teacher forums for new techniques or how to implement a specific strategy that I have in mind. It will be so nice to have these all in one place as a resource. They are ones that can easily be implemented in a classroom. They don’t take much time or money to setup either. One of them is a paid product that I found ($7 at this time), but it had so many products that looked helpful that I decided to include it with this list of free, DIY resources. We all know about having the student take deep breaths. Little Birdie Secrets shares how that having them focused on a purpose (bubbles, feathers, etc.) can help them do this correctly and not feel anxiety or frustration about the process. This is a similar strategy. I like that Kidlutions shares some wording that you can use to help them breathe deeply. Growing a Jeweled Rose has an easy-to-make recipe for some lovely smelling dough. This is great when a student just needs to re-focus or they have calmed down but are still a little “shaken”. This is a similar concept, but a different recipe! Once you make this recipe from the Imagination Tree, you will want to include some things in the rice for them to “play” with as they calm down. It could be a spoon, little cups, etc. They just need something to stir or scoop the rice. This is an idea from Mailbox Magazine. I like the name! The basic idea is to have a box with things to calm and focus – a stress ball, puzzle, etc. This link will only take you to a picture – and I have to say that it’s not the cutest box! But, it will give you an idea for a good strategy that would be super easy to put in place. Students just take out all the cotton balls and count as they put them back in the box. This replaces saying “count to ten” with a helpful kinesthetic activity. Lemon Lime Adventures shares how to make a calming jar or glitter bottle. There are many of these tutorials and pictures out there. I like that this one is plastic (the glass jars look pretty, but that does not seem like a good idea!) and it adds a Lego mini-figurine. You can make it without the Lego figurine or just add any lego piece. It’s just a neat little bonus idea! While I was searching for things to include in my list, I kept coming across some neat printables and they were all linking back to this product. I really like the breath cards where they can count them out as they breathe. This could help them stay focused on breathing. There are also cards with visuals for what they can do when they are angry or frustrated. It includes a social story, conversation card, choice board (love this!) and more! This kit is only 30 pages and yet it looks like it is packed with great resources. Melissa I am printing this and hanging it around my house! My birthday is August 15th and I had no idea! Now I REALLY have an excuse to relax on that day! Hope you find some time to do the same! Thanks for sharing! Great tips! I have a hard time with relaxing too! There is so much to do and so little time!